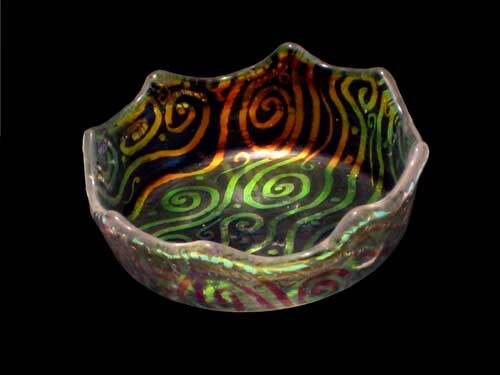 Dichroic glass "crown" bowl or votive cup. I took one of my 4x4 inch sheets of glass, fired it to smooth the edges, then refired it on top of a kiln-washed steel form. Here's the result. About 3 inches diameter, with the inner diameter of the cup being about 2 inches. I really love how the crown points make weird, subtly pink and blue shadows cast when it's lit! The shadow isn't entirely symmetrical... I rotated the cup so the "big" shadow side would be nearest the camera. This cup is a little big for the tea lights I prefer, IMO. 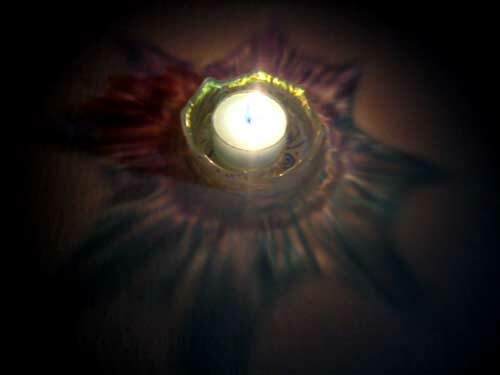 But, I have some new steel cups coming to use for that -- then it'll fit the base of the tea light perfectamente. I left this one in the kiln longer than I planned, so the sides aren't as ruffled as I'd imagined. On the other hand, the "crown" look wouldn't have been as pronounced if it had more flare. 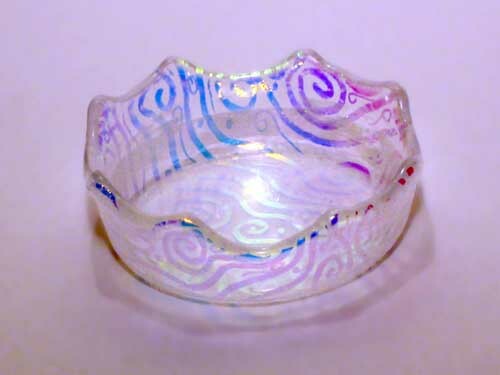 For future pieces, I'll make some little round dichroic "gems" to sit on the outer edges of the glass (see the next post.) As a result they'll act like sparkle lenses when it's lit, maybe. Their weight would change how it drapes, though. Hmmmmmm. Since this cup is bigger than the ones I plan to make later, I'm thinking... mm... $20? With Priority Mail, that'd be $24. No idea on pricing, can't help you there, but I appreciate you sharing the beauty. And I can't stop looking at the razor wing pieces!